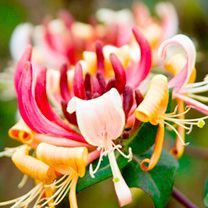 Lonicera Chojnow is a compact growing climer. Fragrant magenta and white flowers smother the plant over a long flowering period throughout summer, followed by ornamental red berries in autumn that birds will love. Supplied in a 3 litre pot.